Juugo has orange-like hair and his hair is wild and spiky. In prison, Juugo wore Orochimaru's prison clothes. 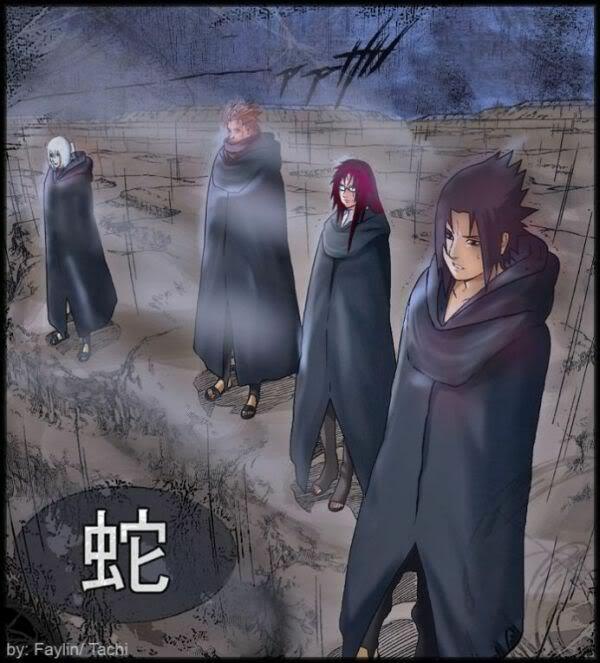 However after teaming up with Sasuke, he wore a black robe that came from a curtain and also wears Akatsuki robes sometimes. Juugo has two sides of him. Whenever his curse mark takes over, he loses control and becomes a murderous killing machine. Whenever he feels like murdering someone, the curse mark gives him sueprhuman strength and Juugo would be impossible to stop- except by Kimimaro and Sasuke. He's an uncontrollable assasin and his temper is dangerous. However, in another side, he's usually calm and silent. He looks around peaceful areas and talks to small animals like birds. The best way to stop Juugo from going to "rage mode" is to chain him in a prison cell alone. Juugo was the original source of Orochimaru's cursed seal experimentation. Juugo possessed the ability to morph and strengthen his body. Unfortunately these abilities were not under his control, when he began to change he lost control and became a simple killing machine. For this reason he sought out Orochimaru in the hopes the skilled ninja could help him. Orochimaru took Juugo to his northern base and used his genetic structure to synthesize a enzyme he could implant in others. This enzyme would be implanted with the curse seal and allow the wearer to draw out more of their power. Juugo was put under heavy lock and key alongside numerous other prisoners who were experimented upon with his curse seal. For many long years Juugo remained imprisoned. When Sasuke finally defeated Orochimaru, he began to gather subjects within Orochimaru's sphere of influence to assist him in his plans. His new team included Mist ninja Suigetsu, Karin a prison guard and Juugo. At some point in the past Orochimaru had Suigetsu fight Juugo, however Juugo never revealed his strange abilities in the fight. At some point in the previous years Juugo also met Kimimaro, and formed a bond with the young man. Suigetsu and Karin were both unsure about having Juugo join and when he was initially freed, he was in his crazed state and lashed out against Sasuke. Suigetsu arrived and began to battle Juugo much to Sasuke's dismay. Sasuke sought to sway Juugo by explaining how Kimimaro gave his life for Sasuke. Juugo finally relented and offered to assist Sasuke, to see the full nature of Kimimaro's sacrifice. Juugo is a very skilled ninja and is a master in Juuinjutsu (curse mark seal jutsus) and taijutsu. He's also the ultimate shinobi of curse mark users. A blistering cloak was blowing in the wind, flapping and clapping along with the calm and wild breeze. Oh what a good day it was and what a good day it was to be the leader of the Akatsuki. Pein trenched upon the cement Akatsuki grounds of the very lair that he had made leadership on. The man opened his grayish eyes, the circular swirls within his eyes being steady and not moving one inch. His depressing seeming emotions were not that obvious as he carried the blank expression that he had always put on for the Akatsuki, the only one seeing him smile being his partner, Konan. As Pein walked through the Akatsuki lair, he finally began to approach a very large room, a room in which he would take his seat on the central part of the table in. He placed his hand on the silver handle and a gleam upon his ring began to shine, meaning he was sending out a special signal for all of the Akatsuki members to meet up in this room he was walking into. Pein turned the handle and opened the door to this room, the large and wide spaced room or more like cave. A table with several different candles was placed in the middle of this very vicinity and seemed as if it had been calling pein’s name. As pein walked towards the table he would begin to think, how and when the Jinchuuriki would be spotted. He would then walk to the table and pull out a chair, calmly taking a seat in the chair. The chair had stood in the middle of the table, making it seem as though Pein was indeed the Akatsuki leader. It was highly apparent of this as he then took a look at the candle which stood tall and straight in front of him. Ah how the flames of peace had looked so pretty, this would be something he wanted to bring to the whole world. Memories of his past came to mind, sitting in Yahiko’s body, he remembered, the past that the three had shared. Such friendship, such well awareness, such a bond, such a…connection that the three held. How much Pain could one take? Was the question in Pein’s mind, as his brain began to show him memories and as he began to slowly reminisce to himself the destruction and Pain and tears he had, the painful remedies that ran through his mind, it angered him so, but also calmed him down as he still stared at the candle. There was a candle in front of every seat, sharing every Akatsuki’s hopes and dream within the flames. Of course all of them had dreams and all of them had hopes, but all of their dreams were most likely shattered, the wants of themselves. What Pain wanted, was nothing, but peace between the lands, peace among the world. He wanted all of the wars to end a simply all of the Hokages to just come to a treaty with each other, all of the harm of the little countries to come to a vast end. But it was highly realized by Pein that this was never going to happen and with that realized and everything said, he blew out the flame of the candle in front of him. Description: Since Jugo is the father of Orochimaru's curse seals, Juugo has a farther/stronger and much more advanced manipulation ability with the curse mark than the Sound Ninja Five and Sasuke. Juugo could spread the curse mark all over his body and then use it to change the form of his body. He could change into any curse seal form and could use it however he likes, also having a farther distance and abilities with it. However, he always bewares his own assasin temper. Description: Juugo spreads himself with the curse mark and is able to use this technique. Juugo could then have flight abilities and also has improved superhuman strength, capable of using aerial attacks. However, the side effect is taht it can activate juugo's dangerous unstability adn he can "flip-out". Description: In his curse mark form, Juugo can manifest objects from his own body as well as inserting as inserting objects in his body and objects in other bodies. He could rapdily grow more limbs or body parts or alter his molecular body, hardening his own body and transforming it. He could also grow something where it hasnt grown before. Using his manipulationa dn transformation abilities, he could change his body parts into a a bigger size or anything to constantly make his taijutsu effective. 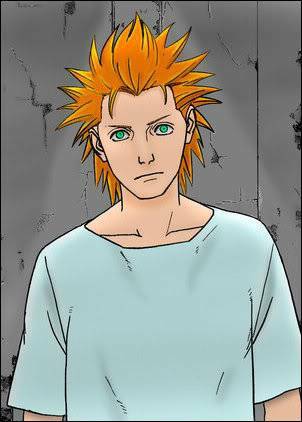 Description: Using his curse mark powers, Jugo is able to alter his hearing and talking. He could understand and talk with any kind of animal and could farther his ability. Description: Using his brute force and superhuman strength while in curse mark mode, Jugo uses taijutsu to use a transformed body part and smash it into an object or human, violently crushing its weight voer it. Description: Using the enemyze genetic material of his body, Juugo could also implant his curse mark on others, having a higher chance of killing them. Hmm. I'd need a second oppinion on that jutsu. other than the second and 4th ones, those would be S ranked attacks. 2nd one would be A ranked.